Clothes and tools are fairly straightforward – anyone can see whether a bee suit is still usable, a hive tool is just a piece of metal, Beekeeping tools and equipment (e.g. smokers and hive tools) can be cleaned using a solution of washing soda crystals (Sodium Carbonate). This can be made up using 1 kg of washing soda to 5 litres of warm water with a dash of washing up liquid to help clean off propolis. Immerse the equipment in the solution, while using a wired brush, or similar tool to scrub off residues until the tools are clean. In fact, you should keep your hive tools in a solution like this at all times. Hive parts are different, as well as joints failing, nails rusting and wood rotting you have to look at disease. 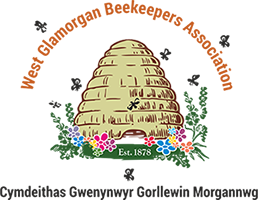 Do you know the history of the hive? If in any doubt, and if the hive is in reasonable condition you should, before taking it anywhere near your apiary, ensure it is sterile. This is quite straightforward – you need to lightly scorch all the wooden components, taking extra care with corners and cracks that could harbour any nasties and make sure that all surfaces have had a touch of the flame. If the hive is a polystyrene one then you need to sterilise it by immersing in a weak solution of Hypochlorite (Bleach) Sodium hypochlorite is present at a concentration of about 3% in household bleach. Research has shown that immersion for twenty minutes in a solution of 0.5% sodium hypochlorite kills AFB spores and other bacteria. In this case you therefore need to make a solution of one part household bleach to five parts water. It is essential that the spores are in contact with the solution, so any items immersed must be thoroughly cleaned. For disinfecting one or two boxes, a suitable tray could be used and each box wall treated individually, before rotating to treat the respective walls. For larger quantities of equipment, a deeper trough will be needed. Remember to wear suitable protective clothing when dealing with chemicals. Queen excluders need to be cleaned and sterilised in different ways, depending on the type used. Begin by removing debris by scraping with a suitable tool (Figure 8). It is easier to remove propolis when it is cold and wintery, as propolis will be brittle under these conditions. A wire brush is very useful to remove bits of wax and propolis. Wire excluders can then be scorched using a blowlamp, but if they are soldered be careful not to melt the solder joints as sometimes they are very ‘soft’. If foulbrood has been present, zinc slotted excluders must be destroyed by burning. Otherwise, it is possible to scrub these clean with a solution of washing soda. This needs to be fairly concentrated (1 kilogram of soda to 5 litres of water), and a dash of washing up liquid in the mix also helps. You will need to wear suitable protective clothing, protect your eyes and use rubber gloves. Plastic excluders can be cleaned using washing soda then hypo chloride. Frames with wax comb in should be avoided like the plague, unless you are 100% sure of the beekeeper that is selling it and certain of its provenance, it’s not worth the risk – brood comb is dirty and can harbour disease and super comb is not much better. Don’t even consider buying it. The last thing is buckets, strainers and the like. Plastic is simple – just ensure it is clean, sterilise if needs be. Remember that strainers, buckets, jars, extractors and the like are for preparing food so must be spotless. All trays, buckets, boxes etc used for preparing honey must be of food grade. Extractors, sieves and settling/bottling tanks must be either stainless steel or food grade plastic. There are still quite a few galvanised steel extractors and settling tanks out there – it is now illegal to use them – the solder used to make them reacts with the honey and can cause leaching of toxins into foods so they are only good for novelty garden ornaments.